Order a signed copy directly from Laura. When Letty Hendrickson dies, she leaves an enormous bequest to Mather College – but to her husband Joel, she leaves 150 acres in Vermont that he didn’t know she owned. Joel goes to Vermont to sell the property, and discovers not a ski-country investment but the Ward Place: an old farm with a family graveyard and a house that is mysteriously clean and well-kept, in spite of having been empty since 1959. As Joel tries to solve the mystery of the bequest, he is assisted by three women. The first is Helena Woodhouse, who had a 45 year platonic friendship with Letty’s guardian Nathaniel Brantford, the iconic president of Mather College from 1940 to 1977. The second is Charlotte (Charlie) Reynolds, a beautiful teenager whose eager research reveals the long-kept secrets of the Ward Place. And finally, first-hand understanding of the Vermont closed to outsiders is provided by Eleanor Randall Klimowski, a scholar who has been fired from her teaching job because of her increasing deafness , and who is now cleaning houses to support herself. What emerges is a tale of romance, misplaced pride, and unendurable sorrow, as Joel struggles to discover whether his legacy was a reproach, an apology, or a twisted but genuine act of love. "Return in Kind is a stunning, highly original novel with a cast of gifted characters who confront a haunted past that threatens to consume them. By interweaving family journals and letters into a seamless contemporary landscape of the wayward college, the mountaintop mansion and the struggling farm, Stevenson creates a lyrical work that reads as if a Shakespearean tale were magically transformed by the northern foothills of New England. A small masterpiece, Return in Kind is crafted with both a deft regional hand and a broad cultural arc as it boldly confronts the eternal conflict between the yearning of the human heart and the implacable march of time." 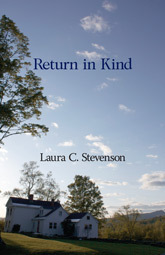 "Laura C. Stevenson's wonderful RETURN IN KIND shows us the depth and spirit of geography: how generations, living and dead, can sing from a single patch of ground. Her main character, Joel Hendrickson, has lost his wife and is left land from her family in the stark beauty of Vermont; it is an inheritance which, he soon sees, offers answers to mysteries about his wife, Letty, and about his own soul. A vivid cast of characters, living and dead--the wise Eleanor, the stunning young Charlie, the ghost of Nathaniel--surround him in this place of discovery, darkness, rebirth; Stevenson stitches their lives together--their meaning for one another--brilliantly. The work is a rarity, steering clear of popular strategies and offering unrelenting honesty. This is a powerful read--a highly intelligent, moving, and humane novel." Joseph Hurka, author of Fields of Light: A Son Remembers His Heroic Father (winner of the Pushcart Editors' Book Award) and the novel, Before.